Prepare your chicken by cutting off excess fat and then cutting the chicken into bite size pieces. Add the chicken to the pot. Prepare your vegetables. Peel your carrots. Wash your green beans and trim off the ends. Cut them in half. Wash your potatoes and cut the red potatoes in half (for firmer) or in quarters (for soft). Add all the vegetables to the pot. Cover the pot and secure the lid. Set valve to sealing. Set the manual/pressure cook time to 5 minutes. When the pot beeps indicating that the time is up let the pot sit there for 5-10 minutes and then perform a quick release by moving the valve to venting. Open the pot and scoop the chicken and veggies onto serving plates. Eat and enjoy! I used a digital scale* to measure my chicken and vegetables. 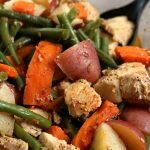 Chicken–you can use cut up thawed chicken breasts or cut up thawed boneless, skinless chicken thighs for this recipe. The thighs add more flavor and fat than the breasts. Bone-in chicken won’t cook at the same rate as the vegetables so I would avoid that. Carrots–the carrots get to the point of being mashable in the 5 minutes of pressure cooking time. If you prefer your carrots a little less soft then I would put in the thicker baby carrots or peel whole carrots and throw them in without cutting them up. Green Beans–my favorite part of this meal is the fresh green beans. Don’t use canned, they would just get way too mushy. Potatoes–I used halved red potatoes and they were soft but not mushy. The first time I made this recipe I quartered the potatoes and they got a little too soft for my liking. I bet yellow potatoes would also work well with this recipe. If you want to use russet potatoes I’d cut them up into cubes in order that they cook the same rate as everything else.